A beautiful Urban Asian Glam Mansion. Ownerbuilt. Prime Location. 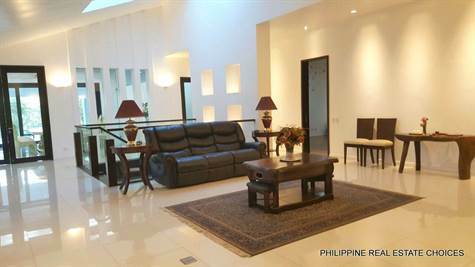 Located in one of the prime areas of the village, this mansion has 2 levels: the ground floor and the walk-out basement. Add to that the loft in the office room. The walls of disappearing glass opens to the patio and infinity pool from the ground floor master's bedroom, formal living & dining room, breakfast nook and the opposite bedroom. Their gourmet kitchen is furnished with the island granite cooktop plus state of the art appliances: (Sub Zero) refrigerator, a range hood, built-in microwave and convection ovens and an espresso machine. Adjacent to this is the 6 seater white table for the people to enjoy watching the cooking skills of the owner. Note: Furnitures not included except in those in the kitchen. Buy a lifestyle!!! Call or email us now for viewing!